Few writers ask us to question our fundamental assumptions about education as provocatively as Alfie Kohn. In this new collection of essays, Kohn takes on some of the most important topics in education of recent years. His central focus is on the real goals of schooling — a topic, he argues, that we systematically ignore while lavishing attention on misguided models of learning and motivation. From the title essay’s challenge to conventional definitions of a good education to essays on testing and grading that tally the severe costs of overemphasizing a narrow conception of achievement, Kohn boldly builds on his earlier work and writes for a wide audience. He explores topics ranging from the destructiveness of praise to the inadequacy of American high schools, shows how traditional educational practices can spoil the value of newer and better approaches, and offers a provocative reflection on what 9/11 and its aftermath can mean for schools. 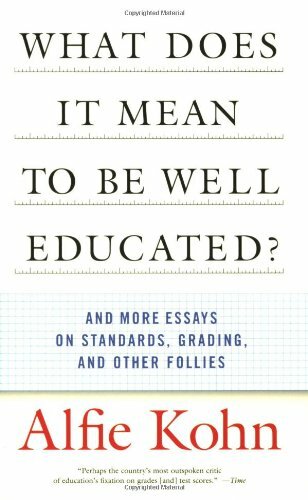 1 What Does It Mean to Be Well Educated?